This is the third and final part of my round-up of the books I’ve enjoyed most in 2014. See my posts on the best comics and best children’s books for the first two parts. As with children’s books this year, I’ve read an awful lot of great general fiction. But after a lot of careful consideration, I whittled the list down to the five books that I’ve enjoyed the most. Perhaps not the best books, but “best” and “most enjoyable” aren’t synonyms, are they? The latest Haruki Murakami was excellent, and by any objective standards would probably get a place on this list, but in the context of his oeuvre it fell slightly flat, so it didn’t quite make it. So finally I came up with my five. Well, six, if you count the two books in the same series I lumped together. Then my partner gave me The Book of Strange New Things by Michel Faber for our anniversary. I finished it this morning, and after pondering it all day, I don’t see how I can leave it off the list. But then again, I don’t want to drop No. 5 from my list either, as I really, really enjoyed those books. So here are my top 6 adult books of 2014. My gaff, my rules. 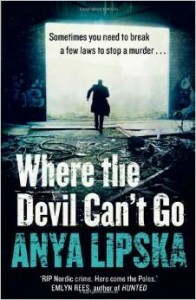 I don’t read an awful lot of crime – the occasional Ian Rankin, I suppose, and the triumvirate of supernatural crime Ben Aaronovitch, Paul Cornell, and James Oswald, if they count – so I’m not entirely sure how I came across Where the Devil Can’t Go by Anya Lipska on the Kindle store, nor what possessed me to buy it. It’s just one of those serendipitous events, I suppose. See, it can still happen in the digital age! 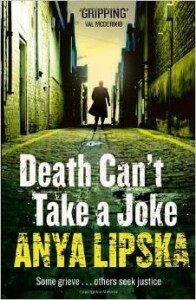 This book, along with its sequel Death Can’t Take a Joke, feature Janusz Kiszka, a sort of private investigator and unofficial “fixer” for London’s Polish community, and Natalie Kershaw, a rookie Detective Constable in the Metropolitan Police. They attack the same case from completely different angles, meeting at tangents and bouncing off each other. The crime investigations are well constructed, the characters sharply realised, the dialogue vivid and evocative, and the setting just that little bit different from the metropolitan norm. The comic relief is provided by Kiszka’s friend Oskar, who provides some genuinely laugh-out-loud moments. My only problem is that I wish there was a guide to Polish pronunciation in the back – I often heave a sigh of relief when Kershaw messes up a Polish word and Kiszka corrects her phonetically! Amazon list a third book in the series coming next year, which is great news. 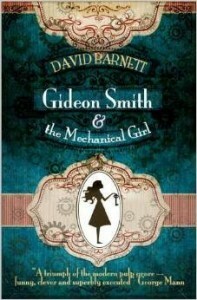 Gideon Smith and the Mechanical Girl is a pulp adventure set in a steampunk alternate history, where the British Empire covers three-quarters of the globe, airships sail the skies, and Lucian Trigger, Hero of the Empire, has his tales of derring-do immortalised in penny dreadfuls. Inspired by these stories, when Gideon Smith finds out that his father is lost at sea, and supernatural forces seem to be at work, he sets off from Yorkshire to track down help. On his journey he encounters Maria, the mechanical girl of the title, and his adventures only get stranger from then on. It’s a cracking read, reminiscent of the pulp adventures of the past injected with a modern sensibility. Various characters from history and literature crop up from time to time; the Bram Stoker and Elizabeth Bathory subplot is especially entertaining. The second in the series, Gideon Smith and the Brass Dragon, is on my “to-read” list, and the third, Gideon Smith and the Mask of the Ripper, is due out in 2015. 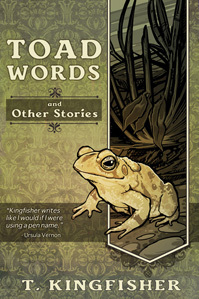 T. Kingfisher is the pseudonym of Ursula Vernon, a writer and artist probably best known for winning the Hugo for her comic Digger in 2012. Under the Kingfisher brand, she’s put out three self-published books: Nine Goblins, a comic subversion of fantasy, which I read last year and thoroughly enjoyed, Toad Words, a collection of short stories, and The Seventh Bride, a fairy tale re-telling of the Bluebeard story, where a new wife-to-be tries to avoid the fate of her predecessors. All three are excellent, and show her wonderful facility with myth and fairy tale. By their very nature, short story collections can be uneven, but each story in this collection works for its place. The highlight has to be “Boar and Apples”, a new take on the Snow White story that seemingly does the impossible by making this most familiar of stories seem fresh and original. 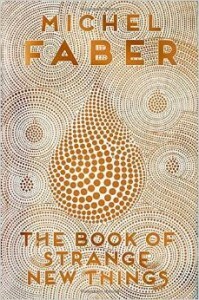 Michel Faber writes an awful lot of science fiction and fantasy while still managing to be shelved in the general fiction section of the bookshop. I’m not quite sure how he does it, and given that The Book of Strange New Things features space travel, an alien world, and alien creatures, I’m completely at a loss as to why it doesn’t appear in the Science Fiction section. I suppose you could make the argument that the book isn’t about aliens and alien worlds, exactly, but is about Christianity, but that never stopped bookshops from placing Michael Moorcock’s Behold the Man in the sci-fi section, so I think we just have to chalk this up to the irrationalities of the book trade. Peter Leigh is a Christian pastor who is recruited by a faceless corporation for a mission to an alien world. The inhabitants there have demanded a missionary, and after undergoing a long series of evaluations, Peter fits the bill. He leaves behind his wife, Bea, and tries to adapt to life both in the outpost and in the aliens’ encampment. He finds a group of aliens who are desperate to hear about Christianity, so he sets about making the bible (which the aliens call the “book of strange new things”) intelligible to them. His only method of communicating with his wife is through the Shoot, an ansible-like device that allows only the intergalactic version of email, but the messages he receives give him no comfort as his wife tells him about the slow mundane collapse of civilisation on Earth. Peter’s faith is treated sympathetically, but you can’t help feel that his religion has betrayed the aliens when the reason for their fascination with the book of strange new things is revealed. Is it a criticism of religion, that offers wonders then says “ah, but, that’s a metaphor” or offers healing then says “but only if God wills it”, or is it a criticism of literal-minded people who can’t see the functional difference between a universe where God works in mysterious ways and a universe in which God doesn’t exist at all? I don’t know, but it’s a fascinating book that provides plenty of food for thought. Patrick Rothfuss is best known for his epic fantasy series The Kingkiller Chronicles, which to date comprises two mammoth tomes The Name of the Wind and The Wise Man’s Fear. 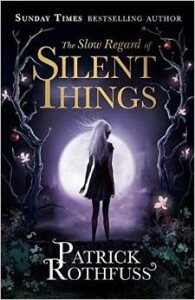 The Slow Regard of Silent Things is set in the same world, and is a novella featuring one of the subsidiary characters from the series. It possibly wouldn’t make an awful lot of sense if you hadn’t read the other two books, but at the same time it’s completely different in tone and in style. It’s a poetic meditation on the troubled and singular Auri, who lives in the abandoned passages beneath the university where much of the other books takes place. The language is lyrical, there is no dialogue, there is no plot other than the machinations within Auri’s own head and her struggles to impose order on the chaos of her inner universe. From the reviews I’ve read, it’s a book that either touches you or doesn’t, with very little in between, although the way in which it touches people seems to vary. For me, it was the way that Auri imposes personality and character on inanimate objects – it was a tendency I had when I was younger, and although it’s faded with age and time, it struck a chord with me. Very much a Marmite book, but if it reaches you, it can have quite an effect. Where do you start with this book? 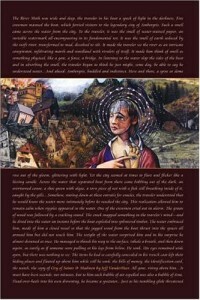 City of Saints and Madmen is a vast, ornate, baroque, monster of a novel. If novel it is, because it’s formed of disjointed novellas, short stories, histories, appendices, letters, and glossaries that together build up a picture of Ambergris, a city of horrors and wonders, where mushrooms and giant squid have a hold on the imagination and minds of mankind, and there are rather more madmen than saints. The city’s history is hinted at, with recurrent threads tying the whole thing together, so that the whole is very much more than a sum of its parts. Some of the individual pieces would be fascinating and entertaining pieces of fiction on their own, but its only when taken together, with all of their reinforcing motifs, that the whole picture emerges. Not that you’ll ever know everything about Ambergris, no indeed – there are mysteries that will never be explained – but the city seeps into your imagination. In terms of scope and ambition, I can only compare it to a work like Alasdair Gray’s Lanark, which is probably the highest compliment I can pay a work of imaginative fiction. I’ve just finished Annihilation, the first volume in Mr VanderMeer’s Southern Reach trilogy, and while it’s a very different book in tone and style, Area X is definitely the wilderness counterpart to the city of Ambergris. I’m going to evaluate the trilogy as a whole when I’ve completed all three books – I’m willing to bet that it finds a place on my 2015 top books. Check back in a year to see if I was right.